As the leading haircolor company in the professional industry, Redken is also a proven authority in the care of color treated hair protection. Combining this expertise with its continued commitment to innovation, Redken introduces Redken Color Extend, advanced shampoos, conditioners and treatments dedicated to the care and preservation of color treated hair. Shampoo for color treated hair, protects haircolor from fading and UVA/UVB ray protection. 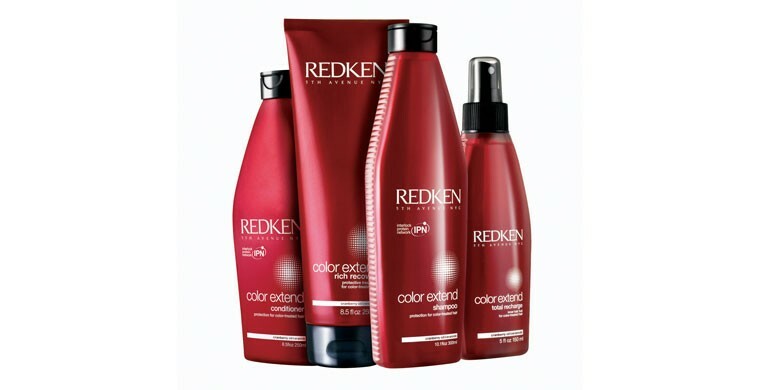 Redken’s Color Extend shampoo is an award winning product that maximazes color vibracy while strengthening hair. Discover all the benefits of this shampoo for color treated hair and improve your hair’s appearance and manageability. Conditioner for color treated hair, resurfacing the cuticle for a smooth, vibrant finish. Color Extended Conditioner uses our Fade Resist Complex with IPN, that helps with color retention, anti-fade protection, maximizes color vibrancy and strengthens hair. Try Redken’s conditioner for color treated hair to improve your hair’s health and appearance. Protective treatment for color treated hair that provides deep conditioning to leave hair, manageable and vibrant. Specially formulated to provide stronger protection to extend life of hair color, this treatment for color treated hair uses Fade Resist Complex with UVA & UVB Filters to help lock in color and block out aggressors.